The Centre for Archaeological Fieldwork, QUB have been excavating at Carrickfergus Castle, Co. Antrim. They’ve been uncovering some of the 19th century military aspects of the castle. In particular, they’ve traced the length of a munitions tunnel where ordnance was off-loaded from ships and taken into the castle for storage. 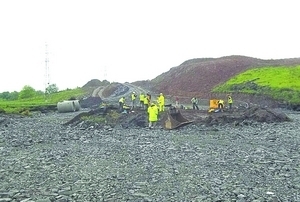 So far they’ve found a number of narrow-gauge tracks, and a turntable for moving this material around. In amongst the tightly-compacted back-fill they’ve recovered numerous artefacts from earlier periods of the castle’s occupation. The excavations are being directed by Ruairí Ó Baoill author of, among other things, Hidden History Below Our Feet: The Archaeological Story of Belfast. The Chapple family braved the rather nasty weather today to go see the project. It was lovely to catch up with old friends and former colleagues and see the results of all their hard work uncovering a portion of the castle’s story that I know particularly little about. For the benefit of those who couldn’t be there, but share an interest in Northern Irish archaeology, I offer a few snaps, some rendered in 3D for your viewing pleasure. You’ll need to buy a set of the red/blue kind (or make your own). If these are not to your taste, I have selection of more traditional 2D panoramas: here. 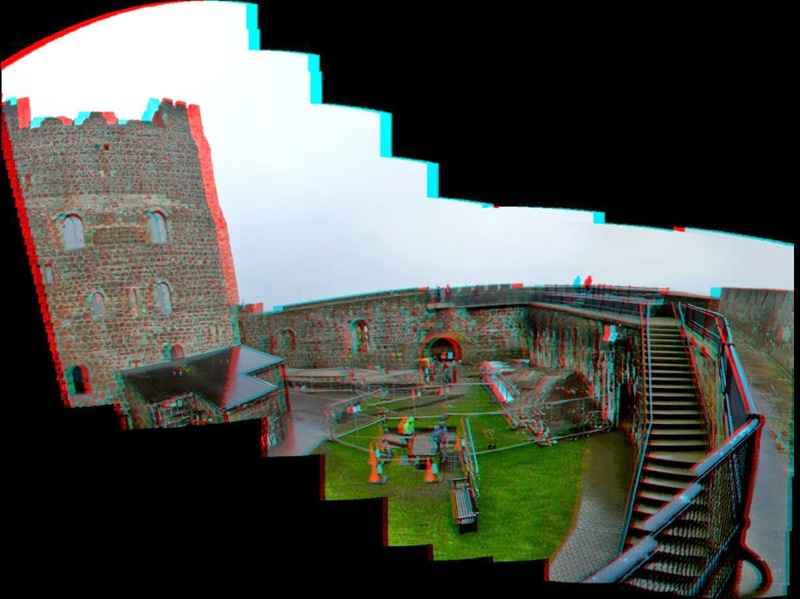 A selection of 2D panoramas of Carrickfergus Castle (click for larger images). 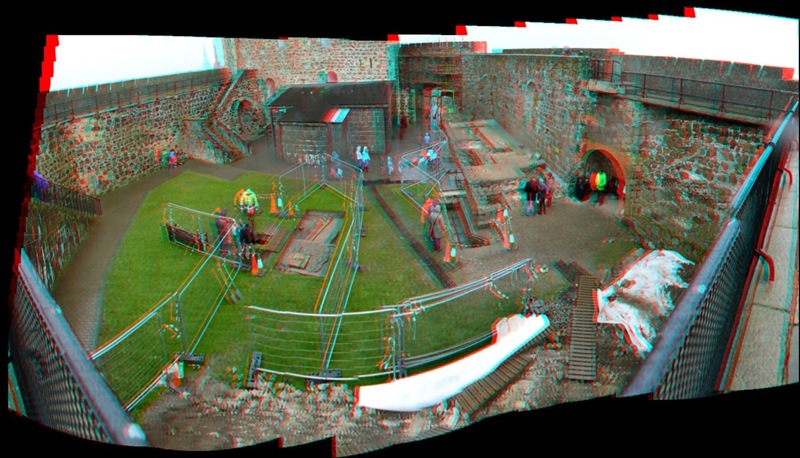 The 3D versions are available: here. In a recent piece on the current financial health of commercial archaeology in Northern Ireland I speculated that the Northern Ireland Environment Agency (NIEA) may not have a coherent plan in place to deal with the heritage implications of one of the commercial archaeological companies going bankrupt. This is a serious consideration, as my research had shown that the financial viability of all of these four consultancies has suffered markedly in the period from 2008 to 2012. Without repeating the entirety of the previous post, the situation can be best summed up in the Net Worth, averaged across all companies where the data was available. This indicated that the mean value was £192k in 2008, rising slightly to £209k the following year. However, this dropped sharply to an average of £6.5k in 2010 and to a mere £2.3k in 2011. It made a slight return, reaching an average of £9.5k in 2012. However these figures mask actual negative Net Worth for two companies in 2011, and for one of them in 2010. If one or more of these companies were to enter administration or file for bankruptcy, I felt that the implications for a significant portion of our shared excavated heritage of Northern Ireland (and for the Republic of Ireland, too) could be catastrophic. 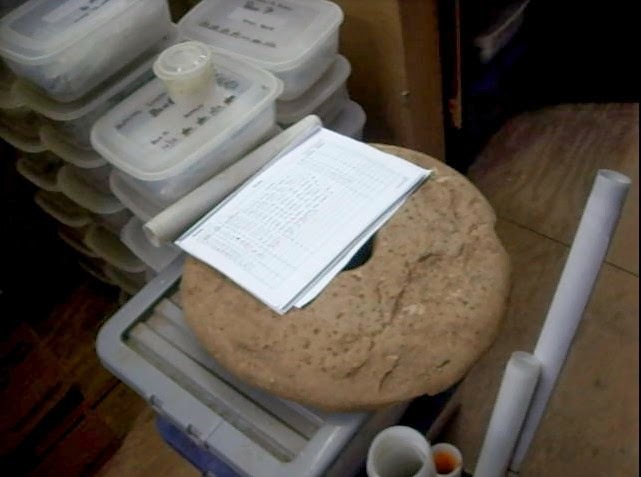 A report by Hull (2011) estimated that the four commercial companies together held approximately 1.47 million items from archaeological excavations, along with large paper archives of original field notes, context sheets, scale drawings etc., along with digital archives of various forms. The vast majority of this material has little intrinsic value, but it does have significant cultural worth. My fear is that, if one of these companies folds, those charged with selling off the assets to pay off the banks and other sundry creditors will be immune to the charms of ‘important’ but worthless boxes of pottery sherds and flint assemblages. The whole lot could easily end up at the city dump. This would be nothing less than an intellectual and cultural catastrophe for Northern Ireland. The chief comment I would make at this time is that since I moved to Belfast in 1997 (nearly 17 years ago) this has been the acknowledged situation. In those 17 years nothing has changed. It was bad back then, but the Celtic Tiger years only exacerbated the situation. One impact of the post-2008 collapse was that the financial pressures on commercial companies to store all this material became more and more onerous and burdensome. While it is a statement much to be welcomed, to hear that the NIEA are now putting plans in place 'to bring forward potential solutions to this matter', I fear it may be too little, too late. 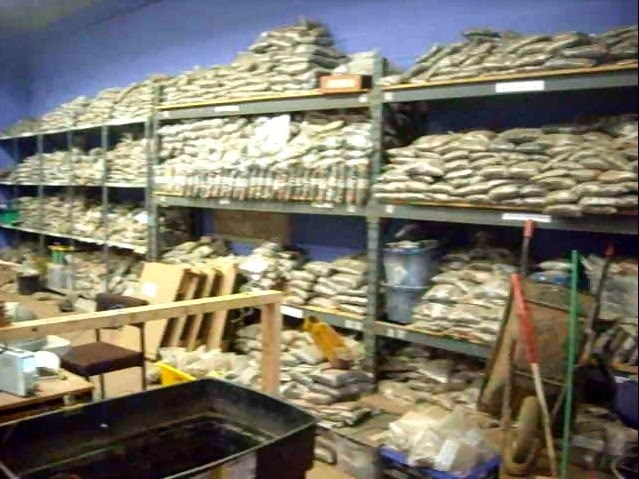 While a recent investigation by Kevin Magee for BBC News NI (here) has shown images of one warehouse owned by an archaeological consultancy, piled high with artefacts, archives, and samples, it may be too late for others. I have written before about persistent rumours that one company called up previous clients and instructed them to come collect 'their' artefacts or face an annual bill for curation. To the best of my knowledge, a number of construction companies sent over representatives to collect the material. 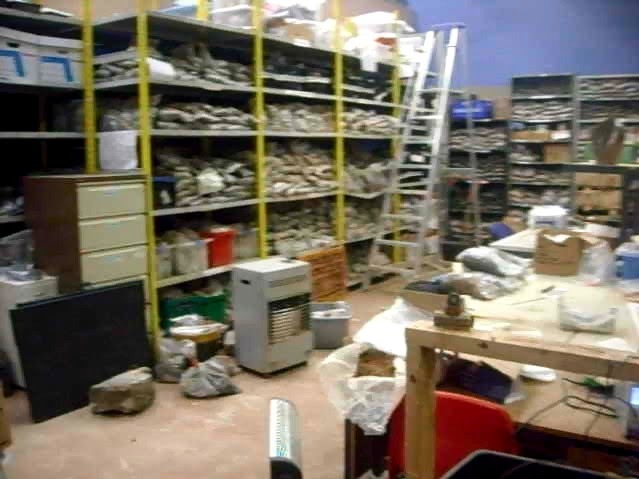 I am given to understand that large collections, from several significant excavations, were loaded up and driven away. 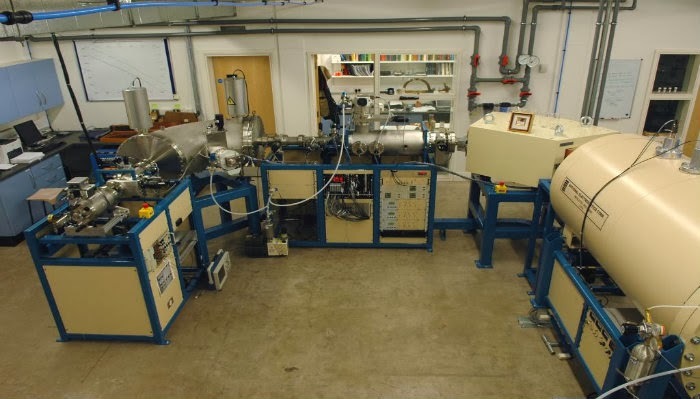 I'd love to think that much of this material can be recovered for future study by students and academics, but I genuinely believe that this material is lost forever. Even if it hasn't been dumped in the nearest landfill site, the chances that it is being carefully cared for - even if can be found - are pretty slim. I should point out that, even if true, the actions of this company were wholly within the law. It doesn't make it any less repugnant, shameful, and an act of cultural vandalism. As I say, I welcome John O’Keeffe's words and look forward to seeing some action on them before more culturally significant material slips from our grasp and is lost forever. Hull, D. 2011 Archaeological archives in Northern Ireland: Legislation, guidance and comparison with other jurisdictions. Research and Information Service Research Paper (NIAR 621-1). Northern Ireland Assembly, Belfast. I'd like to take this opportunity to introduce Lauren Jean, a US student seeking funding to undertake interesting and exciting research: The Hands of a Healer: The Culture of Medicine in Late Medieval Ireland. I would urge you to read about her research and consider donating to her fund. Every donation will be matched dollar for dollar, so even a small contribution can go a long way! For undergraduates in the United States who hope to apply to PhD programs, the writing of either a senior thesis or an honors thesis is a fairly crucial piece of the overall application. Yet as I approached my junior year, I was somewhat at a loss as to what I wanted to research. I have a strong grounding in Modern Irish history and have spent nearly a decade trying to examine the Easter Rising from a number of different angles. Yet I wasn’t entirely positive that I wanted to do my doctorate in that area—there was just something about Gaelic Ireland that kept drawing me in. Additionally, one of my favorite professors at William and Mary was the medievalist in the department. Thus I spent a good deal of Summer 2013 attempting to find something I was interested in, hopefully a topic that would lie at the intersection of medieval Ireland, the hereditary learned families and cultural history. Unfortunately, what immediately came to mind was the Contention of the Bards, an early 17th century poetic dispute that arose in the wake of the Tudor Conquest, between the poets of the southern and northern families. Unfortunate because in 2011 a W&M student had written an honors thesis on Tudor policies towards the Bards during the Conquest; while I have a strong interest in Gaelic poetry and writing history from the Irish perspective, rather than that of the English administration, I also did not need my thesis compared to hers in any way, particularly since it seems likely that our committees will be somewhat similar. Nonetheless inspiration did eventually strike, from a rather unusual source: my younger brother. My brother is an engineering student at Syracuse University, who recently decided to join the volunteer ambulance corps as well as change his major from electrical engineering to biomedical engineering. Thus a great deal of medical jargon was floated around the house that summer; as I’m not exactly versed in modern emergency medicine, I would respond with examples from history, usually irritating my brother. Nonetheless, one day it finally dawned on me that my amateur interest in medieval medical folklore, my desire to more fully flesh out my family history—which includes the Cassidys of Fermanagh, physicians to the Maguires, and my academic interest in the culture of the learned Gaelic families could lead to some fairly interesting research. Odd topic in hand, I approached my soon-to-be-adviser that fall and began skirting around the topic of my topic. Finally, after he agreed to advise me, I let him know what my plan was. To say he was surprised would be an understatement; it’s not every day that an undergraduate at one of the US’s leading schools for Colonial history announces intent to study the medical manuscripts of Gaelic Ireland, in the original language. Thankfully he still agreed to advise me, but there was little he could do in terms of pointing me towards sources; this was fair and was something I knew going in, as it was nowhere near his area of expertise. As an American student studying Irish history, I’ve always had to conduct my research independently. In a way, I’m thankful, as this sink-or-swim approach has allowed me to hone my skills to such a high level, yet I often worry about the historiographical waters I’m treading in. As I started digging into the secondary sources over winter break it consistently hit me that there seemed to be a dearth of sources on this topic. There were a few valiant scholars, particularly Aoibheann Nic Dhonnchadha at the Dublin Institute for Advanced Studies working on the topic, but there wasn’t the sort of preponderance of sources one tends to expect, even with obscure topics. I knew I could lay my hands on any number of secondary sources for the poets, and a slew of primary sources as well, but it seemed odd that another segment of the learned class seemed so comparatively neglected. As I worked, it began to dawn on me precisely why that was. 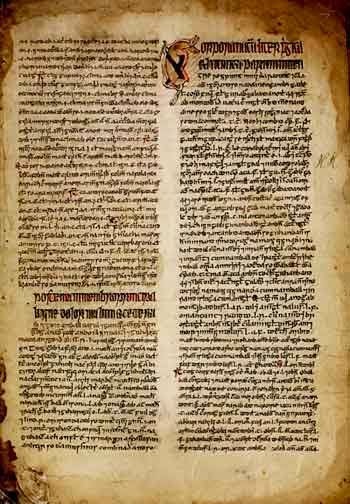 Many of the surviving manuscripts, though written in Classical Irish, were largely translations of Latin or Continental medical treatises; in essence, the period of the Gaelic revival actually represents a break in the continuity of the fascinating native tradition that is described in the early law texts like Bretha Crólige and Bretha Déin Chécht. 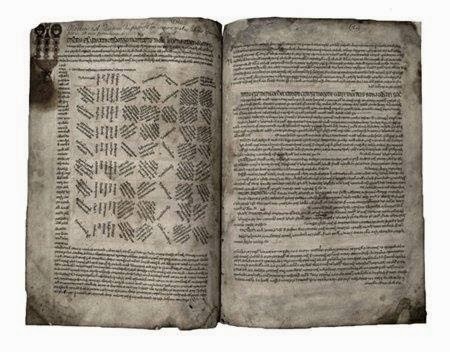 Additionally, on a more practical note, many of the medical texts—which make up a rather large portion of the surviving texts from the late medieval period—have yet to be transcribed, i.e. it requires a background in paleography and Classical Irish just to sit down and read the treatises. While there is a disappointing lack of survival of overt Gaelic culture, I tend to view this as highly intriguing. These texts are an implicit challenge to those who accuse the pre-Gaelic Revival learned class of being stagnant and bound in tradition. 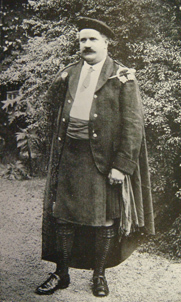 Nor was it an alteration to Gaelic society made solely on the basis of opposition to English culture and mores as were imposed during the Tudor Conquest. Additionally the mere act of translation is going to reveal far more about Gaelic conceptions of medicine and healing than looking at an Irish text singly would, due to the Sapir-Whorf hypothesis concerning how one’s native tongue will shape thought and translation. Essentially, there is not only an opportunity for me to step into a historiographical gap, but to counterintuitively illustrate the pure Irishness of these texts. In order for me to conduct my research going forward, however, I am going to need to go to Ireland over the summer in order to take advantage of a variety of different archives, not only to access the primary sources (many of which are available through ISOS, though not all are) but to access rare, out of print secondary materials in order to understand the scholarship that came before me. To do so, I will need funding. I’ve applied for a grant from William and Mary, however the way the Honors Fellowships work is that they are crowd-sourced fellowships, meaning my research relies upon donations. To date I’ve raised $3620, meaning I have $2380 to go until I reach what W&M considers “fully funded” a grand total of $6000. To specify how the grant is split up, $4K will go to supporting my doing summer research full-time for 10 weeks, $1K goes to continuing to support my research over the 2014-2015 school year, and the final 1K will go to my adviser to assist with the research; I have no control over these numbers, these are the rules that W&M has set up. While I’ve clearly raised a lot of money, I would strongly prefer to reach fully funded stage in order to realize the fullest potential for my research. So, with some very gracious thanks to Robert for letting me post on this blog and also for donating, I am reaching out to you, his readers to help me in my endeavor. No donation is too small—in fact, there is currently a donation match going on, so any donation you make to my project would be doubled. I greatly appreciate any support you can give. Update: April 16 2014. I've just checked in on Lauren's funding page and am been delighted to find that she has reached her target amount. My thanks to all readers of this blog who helped fund this interesting and important research. On January 23rd 2014 I wrote to Prof. Gabriel Cooney. In his role as the Chairperson of the Historic Monuments Council for Northern Ireland, he had been charged by the (then) Minister of the Environment, Alex Attwood, to write a report on the planning and excavation background to the Drumclay crannog issue. My hope was to glean some information on the status of this report and to elicit an idea of the timeframe for its publication. I had been informed by a number of well-placed sources that the report had been written and submitted to Mark H. Durkan (the current Minister), but that there was no immediate plan to make it public. I asked Prof. Cooney if he could confirm this situation. Purely on the basis of ‘if you don’t ask you don’t get’ I wondered if I could have a summary statement of his findings and conclusions. RE: Review of the context of the excavation of a crannog in Drumclay townland, Co. Fermanagh on the route of the Cherrymount Link Road. I must apologise firstly for the very long delay in responding to your email on the matter above dated 23rd January 2014. The report is with the Minister of the Environment, Mark H. Durkan. Following a recent meeting with the Minister my understanding is that the full report is to be released shortly. As I expected, there is no mention of his findings and what conclusions he draws, but at least we have a title to the report and the expectation that the report will be ‘released shortly’. I have written to the Minister (March 22nd 2014) and will provide an update when I receive a reply. July 2012: Urgent! Important Early Christian Crannog in Fermanagh in danger of destruction - help needed! Chapple, R. M. 2012 'Cherrymount crannog, Fermanagh' Archaeology Ireland 26.3, 10-12. Chapple, R. M., O'Dowd, J., & Seaver, M. 2012 'Drumclay crannog, Co. Fermanagh: update' Archaeology Ireland 26.4, 5. Thank you for your email below re: Review of the context of the excavation of a crannog in Drumclay townland, Co. Fermanagh on the route of the Cherrymount Link Road. The content of your correspondence has been noted and a response will issue in due course. Please feel free to contact Seren Griffiths (S.Griffiths[at]mmu.ac.uk)* or Ben Gearey (B.Gearey[at]ucc.ie)* to discuss the session further. Many thanks. In celebration of St. Patrick’s Day 2012, I posted a short piece on this blog about how the very beautiful gravestone of the Saint in the grounds of Downpatrick Cathedral is a recent fabrication, and not an ancient monument. The person behind this apparent deception was the rather larger than life character Francis Joseph Bigger (1863-1926) [see also: here | here] and you can read about the whole thing in: St. Patrick’s Gravestone: A Bigger fake! I’ll admit that a part of me suspected that these pieces would, most likely, be pretty difficult to find again. I’ve heard more than my fair share of stories about items brought into churches ‘for safe keeping’, never to be seen or heard from again. In many ways, this is to be expected – most churches are still ‘living’ buildings and all it takes is one cleric with more interest in the breathing congregation than the historic buildings they curate for stuff like this to get moved about and forgotten. In the century and a bit since the discovery of these three fragments I reckoned that there was more than ample opportunity for these pieces to go missing. On the other hand, I’d not been inside the cathedral for many years and couldn’t remember even if there were and historic bits and pieces on display. Lowest portion of the recovered cross. Decorated panel with spirals. A tang, possibly for fitting into a socket, is visible at the top. This weekend (14-16 March 2014) I had my mother come stay with us. We didn’t have any particular plans other than to spend some time together with her grandchildren, catch up on the gossip from home, share some good food and some better wine. On Saturday morning the conversation turned to ‘we really should get the kids out for a run about’ and we started to talk of destinations, sights to see, and places to visit. In amongst the various places that got mentioned was Downpatrick, Co. Down. Once my mother said ‘I’ve never been there … I’d love to go’ that settled it. Central portion of cross, decorated with roundel of low-relief-interlace. Downpatrick is only about 20 miles from Belfast, on good roads all the way. Once we negotiated the traffic in the town (and hoards of the local youth hefting boxes of Coors Light beer about – it appears to have been on offer) we made our way up to the cathedral. We took the obligatory family photos by the graveside and began a slow meander around the graveyard to inspect and admire the other historic stones. While my children decided to play ‘rolling down the hill and not bashing into the gravestones’, I noticed that the cathedral’s front door was open. I just thought it’d be nice if I found these pieces of the cross languishing quietly in a neglected corner, or behind a curtain vying for space with stacks of excess chairs. I needn’t have worried! The three pieces of the high cross are there – directly inside the west doorway. They’re safe, well, and cared for, and they are presented on a specially constructed platform for their protection and ease of viewing. Here they are: not missing, not lost – still waiting for the day when more pieces are recovered! Final pieces of cross, placed by Bigger under the head portion. Possibly decorated with low relief caving of square knot-work. Inside Downpatrick Cathedral. The east window. Filled with the joy of all things Patrick, we decided to venture forth into the adjacent St Patrick’s Visitor Centre. I’ve never been inside the building, but I do know the site well – in 1998 I worked on the archaeological excavation that was necessary before the building could go ahead. I don’t propose to give an in-depth review of the place and the contents of their displays, but I would like to offer a few notes. In the first place, the entrance fee was remarkably reasonable - £12 for two adults, two children, and one senior citizen … admittedly, we didn’t avail ourselves of the option to use the headsets – two excited young boys are enough fun to look after without adding further impediments! The layout of the displays are stunning, though provoking, and present a well-rounded portrait of both Patrick the man and the mythology that has grown up around him. The tour ends in an auditorium with the ubiquitous audio-visual presentation. Before you go ‘oh, not another of these’, let me assure you that this one is different! It’s a 180° screen that includes a simulated helicopter ride over the chief Patrick-related sites in Ireland (Downpatrick, Saul, Croagh Patrick, Slemish etc.) – it’s absolutely stunning, but if it lasted even one minute longer, and the helicopter did even one more swoop and dive, I’d have lost my lunch! Speaking of lunch – they have a lovely café upstairs, that’s incredibly reasonably priced. We had three cups of excellent coffee and two generous bowls of ice cream, and the lot came to around £7 – an absolute bargain for this kind of attraction. My only regret about the place is that there was no display featuring the archaeology of the site … but then again (to the best of my knowledge) it has never been published – such a shame! 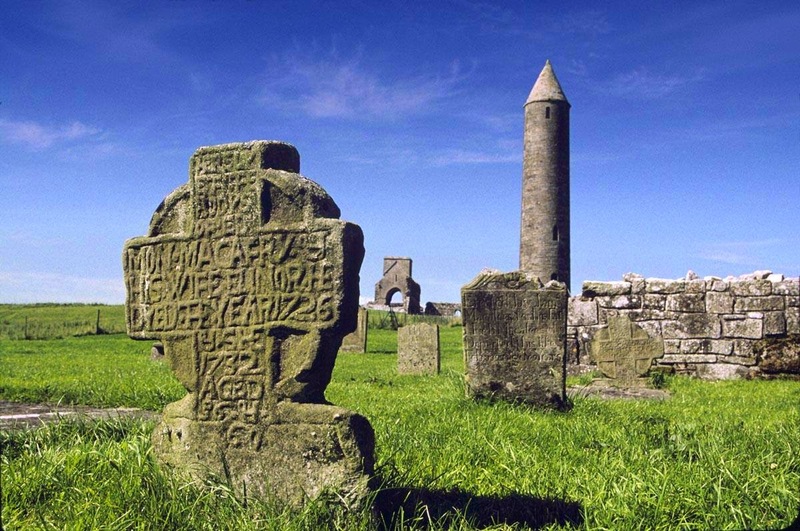 All in all, my advice to those interested in Patrick and his history – from both near and far – is to come to Downpatrick and see the sights for yourselves. They’re beautiful, interesting places, set in gorgeous countryside. What’s not to like? Inside the exhibition hall, linking Ireland's prehistoric and christian heritages. Unfortunately, this s the closest we're getting to the Turoe Stone for the foreseeable future. ... in all its garish glory! Tonsured monks tell the Patrick story. Wishing all readers a very happy St Patrick's Day & hoping that you'll all come to Northern Ireland and visit the Saint in person at Downpatrick! Hi there! 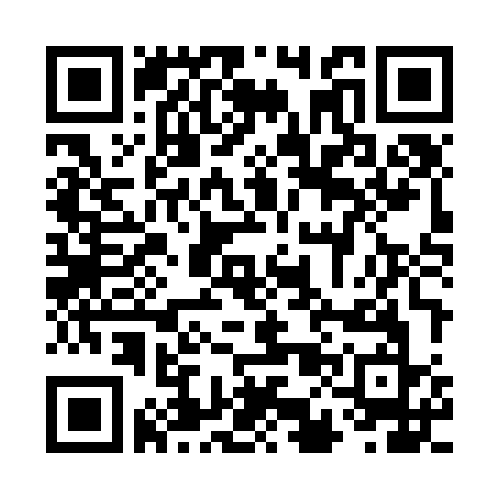 I’m Robert M Chapple and I’d like you to read my blog. If you like the articles I write, or those by the guest authors who pop in from time to time, I’d love it if you’d consider sending me a small donation via PayPal (it’s down there on the right – you can’t miss it!). Failing that, I’d be immensely grateful if you could use the Amazon search portal – it’s down there on the right, too … again, ya can’t miss it! I particularly like that one because every time you use it Amazon pays me (literally) a few pence in advertising fees, but it doesn’t cost you a penny! It's totally optional - I make no demands for payment! That said, I’m not in it for the money – I just love writing and this gives me a great means of remaining connected to the world of archaeology, even though I no longer make my living there. The thing that really keeps me going on this blog is knowing that there are people out there who’re interested in what I write and the work of the other like-minded individuals who’ve trusted me with their own writing. I love seeing when people share my work on various forms of social medial, like Facebook, Twitter, +Google, or Reddit, etc. When we are so overwhelmed with interesting and exciting material coming at us from all directions, it truly humbles me to think that there are people out there who liked what’s on my blog enough to share it with others. Occasionally, I even get emails or messages to say that people enjoy or appreciate what I’ve written and published. I must sound like an idiot when I reply to some of these as I gush my thanks back to them, but it’s an honest response – I’m utterly delighted and amazed that someone has liked it enough to write and say ‘thanks’. When you think of all the fantastic writers out there – in archaeology alone – and someone thought enough of my contribution to send a message … it blows me away every time! 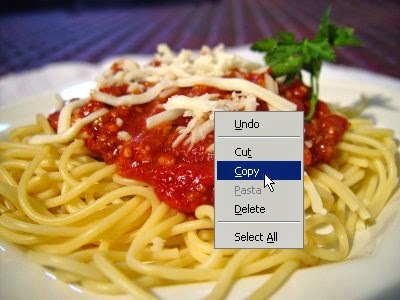 But, do you know what I don’t like? It’s when someone tries to take that away from me! Without indulging in profanity, I can say that it irks me greatly. Thankfully, my experience has been that issues of the theft of intellectual property are few and far between on social media. Sure, there’s plenty of sharing of material – that’s what social media are all about. Post a link here, share a post there … it’s a fantastic way of getting your work seen by those outside of your immediate social group. I’ve benefited immensely from this, and my mission is to be as generous in the promotion of the interesting work of others as they have been to me. I’ve rarely encountered a situation where enough of a post has been reproduced as to make reading the original on my blog unnecessary. That situation changed for me last week (Friday March 7th 2014). In looking at the statistics that are available on the ‘back end’ of Google’s Blogspot site, I noticed a small spike in views (about 50) on T. G. Fewer’s paper ‘The archaeology of the Great Famine: time for a beginning?’. As I say, I’m grateful for all and any views that come my way, but I did wonder at the sudden resurgence in interest in this paper that first appeared on my blog the best part of two years ago. With a little bit of sleuthing and tactical guess work, I traced the source to a Facebook page called: Irish Holocaust-Push to Educate the Facts. I might have expected to find a link to the blog with a short note saying ‘look at this, folks!’ … or ‘check this out’ … maybe even ‘this does not fit the narrative we’re pursuing, but let us respectfully critique their approach’ … ok, maybe not the last one! Instead, what I found was that they’d done a ‘copypasta’ and lifted almost the entirety of Fewer’s article. They’d removed my introduction and the notes at the end, but otherwise it was pretty much the whole text. It’s just shy of 5,000 words and is a smidge over eight A4 pages of text. True, they did insert a sentence at the beginning noting that it came from my blog … well they would have, if they hadn’t misspelled my name. Anyone looking for ‘Chappelle Blog’ will find a whole lot more about the comedian Dave Chappelle than they will about me. I’m sure the gentleman has many fine qualities, attributes, and achievements, but running a blog mostly dedicated to Irish archaeology doesn’t appear to be one of them. They did actually provide a link to the blog … but it was right at the end of the piece. I may be vastly alone in this, but I find that after reading a 5,000 word post, I’m somewhat under inclined to begin it all again from the top in another form, no matter how attractive that may be. Greg Fewer’s an excellent author, and this is a fine piece of writing … but I’m not going to read it twice in one sitting. Their post had quite a few ‘likes’ (I can’t remember exactly how many, but fairly respectable) and 175 ‘shares’ from the page, along with over 20 comments. One of the comments even said ‘I read the whole thing on this page’ (words to that effect – It’s not an exact quote). Even if we imagine that the 175 ‘shares’ were the only reads, that’s still 3.5 times more than the post got directly on my blog on that day. I probably should have let it go. I probably should have clicked away to some other part of the internet and forgotten all about it. Unfortunately, I did not. Just as I was about to report the matter to Facebook for theft of intellectual property two things occurred to me. The first was a memory of Joy Lynskey’s article ‘The Real Story Behind Facebook Moderation and Your Petty Reports’ on The Internet Offends Me blog that reminded me that there are much bigger evils out there that the people behind the scenes at Facebook are battling with than my little issue. The other portion of this was the belief that, if you approach people reasonably and politely, they’ll respond in kind. Apparently the old saying ‘there’s no fool like anold fool’ is right! … or, at the very least: ‘there’s no fool like a middle-aged fool’. Hi there, You have copied and pasted virtually the entirety of the post by TG Fewer posted on my blog (http://rmchapple.blogspot.co.uk/2012/06/archaeology-of-great-famine-time-for.html). I appreciate that you have provided a link to the blog, but this form of cut & paste is simply not fair. 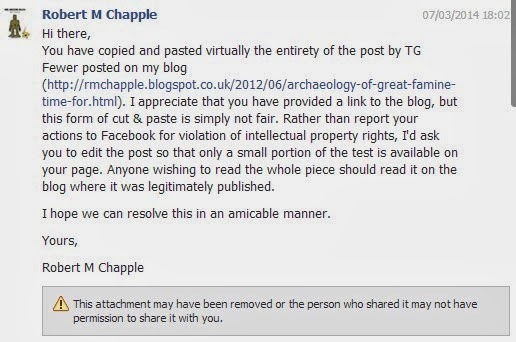 Rather than report your actions to Facebook for violation of intellectual property rights, I'd ask you to edit the post so that only a small portion of the test is available on your page. Anyone wishing to read the whole piece should read it on the blog where it was legitimately published.I hope we can resolve this in an amicable manner. The three sentence response I got was to remind me that my name was mentioned and that there was a link to the post. There was no offer of action, nor any words of contrition, merely: ‘Hope this will cover acknowledging your blog and you will get new members’. My feeling was that this was insufficient. Nothing of substance had changed from before, so I reckoned: in for a penny, in for a pound! I'm sorry, but I must insist that you do not quote the vast majority of the post as you have done. Adding a link to the blog is fine and much appreciated, but the format you have chosen ensures that the vast majority of the people on your page read the post there and not on my blog. This explicitly denies me visitors to my blog. I don't propose to continue this discussion any further, and ask you again to delete the vast majority of the text you have taken from my blog. If you do not wish to do this, I will reluctantly have to lodge a complaint against your theft of my intellectual property with Facebook. A little while later I received a message saying that they’d originally deleted half the post. Maybe they had, maybe they hadn’t, but half was insufficient. I was told that they’d never (actually: ‘NEVER’ … because if it’s in capitals you’re shouting!) received a complaint like this before and that they were now deleting the whole thing. I probably should have left it there. That’s what a sane grown-up would have done. I should have shook my head, run my fingers through my greying locks and ruefully ‘tutted’ at the silliness and incivility in the world. Thank you for removing the post. I'm sorry to have been the first to complain about your policies, but I'm sure if you continue to steal content from legitimate sources, I will not be the last. I was also told that ‘I went further than posting...I gave credit and the link’. I feel that the fact that this person had obviously ignored the ‘please make a donation’ piece is ripe for mockery, but may just come off as a little mean. I’m not going to do that, but you can bet I’m thinking it! I’ve read and re-read that simple sentence, and all I can see is a request to ‘re-share’ the post, not cut and paste the whole thing in a manner that denies my blog or the original author any benefit from it. A wiser guy would have contemplated his amazing hair, produced a manful sigh, maybe even engaged in a bit of lightly sarcastic eye-rolling and gotten the heck on with his life. At just after 9pm on a Friday night – when I should have been spending time with my family, maybe even opening a decent bottle of wine – I sent a final response in the hope that any lingering misapprehensions could be cleared up and, if not, the conversation was going to end one way or another. I asked nicely the first time. 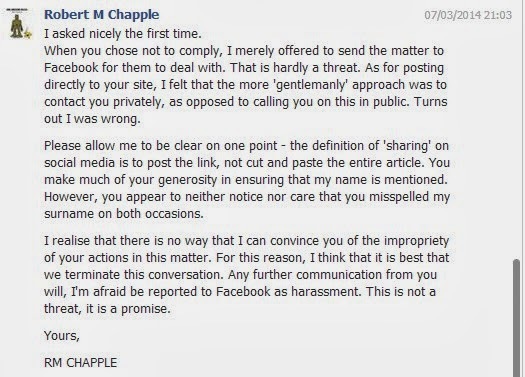 When you chose not to comply, I merely offered to send the matter to Facebook for them to deal with. That is hardly a threat. As for posting directly to your site, I felt that the more 'gentlemanly' approach was to contact you privately, as opposed to calling you on this in public. Turns out I was wrong. Please allow me to be clear on one point - the definition of 'sharing' on social media is to post the link, not cut and paste the entire article. You make much of your generosity in ensuring that my name is mentioned. However, you appear to neither notice nor care that you misspelled my surname on both occasions. I realise that there is no way that I can convince you of the impropriety of your actions in this matter. For this reason, I think that it is best that we terminate this conversation. Any further communication from you will, I'm afraid be reported to Facebook as harassment. This is not a threat, it is a promise. Right! Honestly – that was where I was going to leave it. Truly, no good could come from pursuing this any further. I had spoken about it to a few friends in person and had a general discussion about the issues of plagiarism on Facebook that weekend (though no names were mentioned in public). I certainly never intended to write about this for this blog. That was until yesterday (March 12th 2014). One person with whom I had discussed the issue emailed me to say ‘take a look at this: I think it’s you they’re talking about!’ … you know what? … I think it is! “Irish History behind bars on the www. They are invisible bars protected with copyright laws and so forth. This is to protect bloggers, organisations et al from losing money it seems whilst protecting their rights to their material published. Has our history now become a revenue generator for such individuals and organisations? Is this what it's all about? All should have free access to history. History is just that, it's already happened, its been written about by many people over many generations, books have been published, it has been regurgitated to the point that the source has disappeared into the mists of time, yet anything newly published of the old history under a new name is subject to copyright. It might be worth considering a suggestion that Bloggers and organisations publish excerpts of their works for free distribution to all as a taster and if the reader wants to pursue more information they be invited to pay a fee to an individual or blogger or website owner to access the rest of the information or an invitation to purchase the book or publication. Allowing ready access is causing lots of difficulties to amateur history lovers and explorers and sharers which is a new concept on the superhighway as information is spread across the globe.More responsibility should be put on those who wish to publish their works on an open forum such as the www in respect of applying restricted access to their sites. Of course, there are a small number who are happy to share their works with the public because of their own love of history and their wish to allow free access to all. As I see it, there are two issues here. One is the nature of this page in particular, and the other is the assault on what may be termed ‘professional heritage writers’. I would define this latter group as people with a formal, university-level training in archaeology, history, and any allied fields that contribute to our understanding of the past. Their mode of writing may be blogging, but extends to formal publications in books, peer-reviewed journals, and popular magazines. However, first we have to address the elephant in the room – the nature of this particular page. I am of the opinion that this is nothing less than a hate speech site. From what I have seen, their stock in trade is a blend of that form of Irish and American nationalisms that seek to blame ‘The British’ for all ills, both real and imagined. It is true that not everyone agrees that this form of narrative constitutes ‘hate speech’, possibly because the legacy of Empire casts a long shadow ... but that’s what it is. Their central argument is that the use of either the English word ‘Famine’ or the Irish term ‘an Gorta Mór’ is an inaccurate means of describing the failure of the potato crop in the years 1845 to 1852, along with the attendant mass emigration and large-scale death from disease and starvation that went with it. Instead, they prefer to see this period as one of a concerted genocide, or holocaust, against the Irish people by the British state. The means by which they seek to promote their message is through emotional appeals to crude nationalistic forms, frequently relying on obsolete historical thinking, carefully screened and selected facts, along with simple historical inaccuracies. All of this, in my estimation, is conducted without any genuine knowledge or care for actual history, but is a smokescreen for political sentiment. In short, I find it abhorrent and repugnant. No matter how they choose to dress it up, it is hate speech pure and simple. However, that’s not the issue here. In the quote frequently misattributed to Voltaire: “I disapprove of what you say, but I will defend to the death your right to say it.” My concern here partially with that form of delusion that seems to be prevalent amongst extremist groups of victimisation and censorship by anyone who doesn’t hold their particular set of views. For example, a recent post on the page attempted to frame Facebook attempting to wring a few quid out of them to promote their posts as a form of censorship (IS OUR TRUTH BEING CENSORED BY FB: ‘Censoring or money....either or both are keeping our message from being spread’). This form of world view, while repulsive, is well known and well documented. On the balance of probabilities, I’m thinking that it’s not the latter. Because the events described have already occurred, they must by definition be in the public record and free for all to use - that much we all can agree on. However, my understanding of the next part is that each new book and research paper only serves to further obscure the reality of these events … apparently. Throughout this, historians appear to be part of some secret and oppressive cabal to impose a myth of ‘copyright’ on a sleeping population. I presume that this is just a ruse to maintain those lucrative academic positions and keep the sweet, sweet nectar of continued grant money flowing. Their suggestion that ‘Bloggers and organisations publish excerpts of their works for free distribution to all as a taster’ just strikes me as insane. Oh ... hang on a minute … that happens already! Some academic papers are locked behind pay walls and you can’t get your hands on anything beyond an abstract or synopsis without handing over cash. It’s not always nice, and it’s frequently expensive, but it’s the way that it is. In the same way that books aren’t carefully stacked on shelves and marketed by publishers and bookshops just so they can be given away – they too expect you to hand over your cash before you can have a read. Yes, that’s terribly inconvenient and (again) quite costly, but crying out that your ‘truth’ is being oppressed is not the answer. In any event, this is a total red herring as the majority of the material that has been copied and pasted en mass on this page (it’s not just stuff from my blog that’s being lifted) is material that is freely available on the internet by the authors and publishers … it’s just that we require and deserve the correct recognition for that work. What no one affected by this issue deserves is to have their work purloined and extracted to appear in total on someone else’s page. The contention of this group that “More responsibility should be put on those who wish to publish their works on an open forum such as the www in respect of applying restricted access to their sites” is simply wrong-headed. It’s saying that ‘we took your stuff, but it’s your fault for allowing us near it’. I have two young sons that fight together as much as they play together. They’re quite adept at creating faux-logical arguments such as ‘he started it – he hit me back’ … I don’t accept that from two under-10s and I don’t accept it here. This is a nonsense argument that, once again, seeks to place the blame on external oppressors, rather than take any responsibility for their own actions. Not only that, but there are clear and well-established precedents for referencing both printed and online resources. 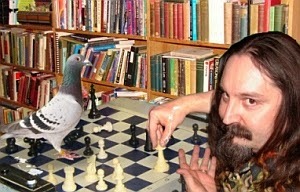 Approximately 4,000 words into this post and I am acutely aware that I am still engaged in a futile game of chess with that proverbial pigeon … no matter how well I perform here, there is little chance of convincing these people that either their view of history is based on political prejudice, rather than any true understanding of the actual events, sources, of broader historical context. Neither will I be able to convince them that their manner of sharing material freely available on the internet is unfair, abusive, and amounts to theft. However, as heritage professionals – archaeologists, historians, genealogists, and affiliated disciplines – we owe it to ourselves and our respective areas of study to take up the fight with those who seek to obscure and distort our history, and use it for their own shameful ends. In the face of ignorance and prejudice, we must strive to promote a genuine understanding of our past, based on documents, sources, and a full comprehension of the broader cultural context. 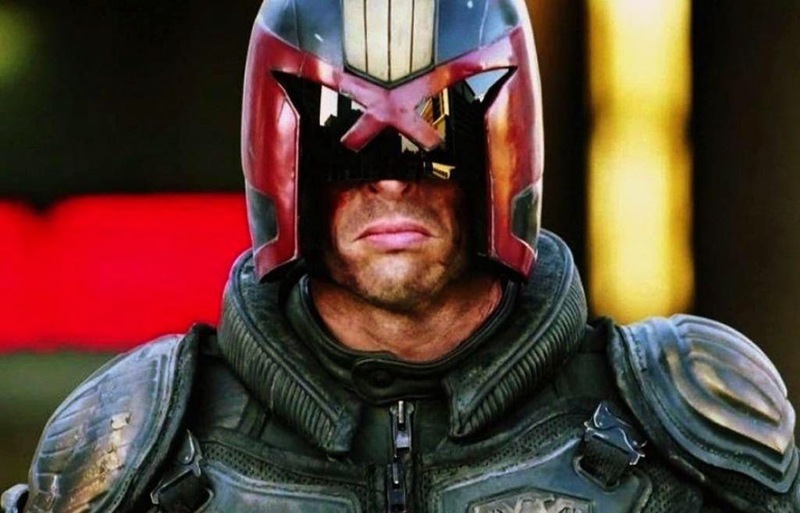 Like the retired Judges in 2000AD, we must take The Long Walk and go out into the radioactive wasteland of the Cursed Earth not to ‘bring law to the lawless’, but to meet these gross distortions head on, to challenge these divisive and fabricated narratives, and to speak out as a voice for real truth and sanity. I don’t imagine that it will be a particularly successful or pleasant excursion, but it is the right thing to do. As Don McLean sang in Starry Starry Night: ‘They would not listen, they're not listening still. Perhaps they never will’ … but we’ve still got to try.